Hittin’ the Trail for Hallelujah Land (1931): The only black and white one on this list. 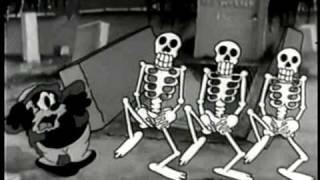 Seems to be a plagiarized cartoon of Disney’s Steamboat Willie and The Skeleton Dance. Includes a Mickey-like character named Piggy and his girlfriend traveling on a steamboat while “Uncle Tom” is harassed by some skeletons in a graveyard. Includes blackface caricatures playing music on the boat. The narrative is haphazard and the “Uncle Tom’s Cabin” reference is obvious. Warner Bros. Plagiarism and racism in one go! Good job, Merrie Melodies! Sunday Go to Meetin’ Time (1936): After a rather musical opening in which we are treated to loads of racist stereotypes, main character, Nicodemus, skips out on church to play craps and steal a chicken. He has a vision of the devil punishing him in hell, and runs scared back to church. Keep an eye out for both the religious and gambling themes – they’re going to appear a lot on this list. Clean Pastures (1937): Parody of a 1936 film called “The Green Pastures”, which was one of the few films of that era to have an all-black cast. The cartoon’s story tells of some angels in “Pair-O-Dice” trying to get people in Harlem to come to heaven. When an inept angel can’t do the job, a group of musically talented angels come down and add “rhythm” to their speech, and the people of Harlem dance their way into heaven. Much attention was put on the music in this cartoon, but not on the animation, as some clips were re-used from the previous cartoon. Uncle Tom’s Bungalow (1937): Parody of Harriet Beecher Stowe’s novel “Uncle Tom’s Cabin”. Two precocious young girls (one white, one black) and a black woman saves Uncle Tom from an evil slave trader. They in-turn are saved from the slave-trader when Uncle Tom becomes rich after winning big while playing craps. Jungle Jitters (1938): A clueless white traveling salesman tries to sell various nick-knacks to an African tribe and must choose between being eaten by the tribesmen (because cannibalism is apparently a thing), or marrying their Queen (who is inexplicably white due to the infamous Haye’s Code not allowing “miscegenation”). The Isle of Pingo Pongo (1938): It’s as bad as the title suggests. Basically a travelogue of a “primitive” African tribe, with a narrator and an early version of Elmer Fudd known then as “Egghead”. All this and Rabbit Stew (1941): The usual Bugs Bunny chased by a hunter gag, except this time the hunter is essentially a blackface version of Elmer Fudd. Bugs beats his foe by winning in a game of craps (this again?!). Warner Bros. Why must you be a part of this Bugs Bunny? 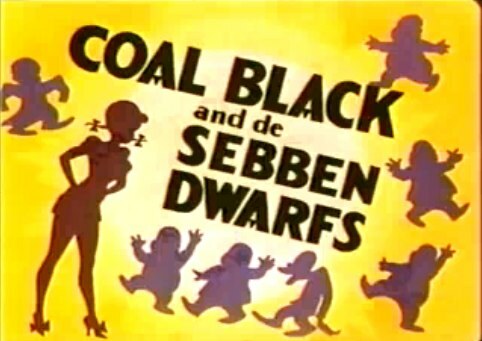 Coal Black and de Sebben Dwarfs (1943): An all-black version of “Snow White and the Seven Dwarfs”, in which our heroine is named “So White”, and the dwarfs are all part of the military. The WW2 era vibes are strong with this one. Probably the most controversial on this list because it is actually considered by some to be a classic animation masterpiece. It includes excellent jazz music and a black voice cast along with its all black characters. The entire short is done in song and rhyme. Tin Pan Alley Cats (1943): An alley cat (who really just looks more like a blackface character than a cat) is warned by a preacher that if he goes into a club he’ll be “tempted by wine, women, and song”. He goes in anyway and gets so wrapped up in the music that he is randomly transported to a surreal “Pink Elephants”-esque scene. Afterward, he runs away from the club in fear, joins the preacher, and sings with him. Angel Puss (1944): The main character, who is given no name other than the racial term “Sambo”, debates whether to drown a cat or not, having previously been paid to do so. The cat escapes, goads the man to “drown” him while pretending to be his conscience, and then pretends to be a ghost-cat haunting him. When the cat’s plan is found out, he is actually killed, and then haunts the guy for real. Goldilocks and the Jivin’ Bears (1944): A parody of the “Goldilocks” fairy tale. Though this time the three “black” bears can play instruments. While they are out, not only does Goldilocks enter their house, but so does the Big Bad Wolf from “Little Red Riding Hood”. He ends up running away after the bears return and Golidlocks dances him to exhaustion. Main takeaway reaction: I’m glad I’m done watching these. What surprised me most about a lot of these cartoons was the repetitiveness of them. Five out of the eleven included instances of gambling, particularly of playing dice, and in two of those cases it is the final gag that ends up saving the day! Again, five out of eleven involved religious imagery with three of them having a specific theme of heaven verses hell and warning against temptation. The most pervasive theme, involving seven out of the eleven had to do with music and jazz, with four of them using caricatures of famous black singers or celebrities of the time, such as the Fats Waller character that appears in Tin Pan Alley Cats. Watching these also made me realize how much I was unaware of certain stereotypes that people had of black people in the past. I fully admit to my naivety and ignorance on this topic, but sometimes certain stereotypes confuse me almost as much as they upset me. Warner Bros. The Fats Waller-inspired character is on the right. Also note the religious image of the halo. From an animation standpoint, there was not really much spectacular here to see. There were plenty of other cartoons of this era that far surpass these ones in quality. Coal Black may be the only one that actually had some decent animation, in both art style and use of motion. But for most of them, there was often way too much being thrown at the screen and especially in the trippier sequences of Alley Cats and Sunday Go a Meetin’ Time they were too bizarre to even really enjoy what little imagination they had. Finally, of course, there was the abundant use of blackface that made the whole viewing incredibly cringeworthy and uncomfortable to watch. I fully understand why they were censored in the first place. Though in a way, I’d have to say that I’m still in the camp that believes that these cartoons should NOT be censored. Perhaps at the time, it was best to do so – it was around the Civil Rights era that these cartoons were taken off air, and this was due to a large push from the NAACP. Looking back at them now, however, I think these cartoons are something that we should not forget. Or at least, we should not forget, and admit that people had some pretty messed up stereotypes of black people. People still do. I’m not saying that these cartoons should be put back on a Saturday morning cartoon block or anything. But what may be a good idea is that if and when they are presented, it is done so in an informed context that recognizes the sordid past that these cartoons are coming from. At the time these were made, some of them were considered rather progressive, since so few cartoons back then included black characters at all. Clean Pastures actually got in trouble, not for its portrayal of black characters, but for having them on the screen at all. According to one critic and strict Hayes Code supporter, the portrayal of black people running heaven and the use of jazz “burlesqued religion”. Another thing I was surprised to learn was that African Americans actually had a bit of a hand in making these films. Five out the eleven employed African American voice talent and musical artists for the cartoons – namely Lillian Randolph, Vivian and Ruby Dandridge, Leo “Zoot” Watson, and the music group The Four Blackbirds. As cartoonist, John Lawing, had to say on the matter of the cartoons, “It is better to risk such misinterpretations than to neglect race altogether”. Ruby and Vivian Dandridge here voiced characters in Coal Black and Goldilocks. If there is any merit to these cartoons it is that they provided a foundation of what DOESN’T work and gave animators and people today a lesson on how to better represent people of different races. We don’t learn things without making mistakes, and we certainly won’t learn from those mistakes if we ignore their existence. Even today some cartoons haven’t gotten it right. The Censored Eleven hasn’t given me any real reason to sing their praises, and they are really not at all enjoyable to watch. But if you are curious about them like I was and are interested in history and old cartoons, then give them a watch. If you pick any of the above, then maybe pick out Coal Black, since I guess some animators like it and it is probably the least offensive one. * Please note that I am white and have never taken an African-based class or studied such things, so I fully concede my ignorance of such matters as racism from a historical standpoint. I have done my best to look at these cartoons from many angles, and as such this is probably the article that I have put the most research effort into, which you can see by the lengthy list of sources below. Please let me know if I have misconstrued any information or misrepresented anyone or anything. This article is purely to bring up a part of American animation history that may have been forgotten, and to bring to light some of the issues that the cartoons both bring up and reflect. Please see below for further reading. Again, other than maybe the commentary on old-timey cartoons, I claim no expertise on this subject. Coal Black an de Sebben Dwarfs: Placing an Animated Masterpiece within the Context of a Legacy of Racism – Contains a wide variety of sources and exerpts of arguments on Coal Black, that both argue for and against the film’s subject matter. Coal Black and de Sebben Dwarfs – An Appreciation by Milton Grey. This link contains feedback on Milton Grey’s article and contains the spectrum of opinions on this topic. Did Bugs Bunny appear in a racist cartoon during World War II? – explores the censored 11 as well as other Bugs Bunny cartoons that portray various racist stereotypes. Reading the Rabbit: Explorations in Warner Bros. Animation, “Darker Shades of Animation; African-American Images in the Warner Bros. Cartoon” by Terry Lindvall and Ben Fraser. Remembering Hollywood’s Hayes code 40 Years On – NPR discussion on the history of the Hayes Code. For the code itself, see here. The 50 Greatest Cartoons – As Selected by 1000 Animation Professionals – Contains the list from Jerry Beck’s book of the same name. Coal Black is number 21 on this list. Tunes for ‘Toons: Music and the Hollywood Cartoon, “Jazz and the Popular Song: The Warner Bros. Cartoon” by Daniel Goldmark – looks at the shorts of The Isle of Pingo-Pongo, Clean Pastures, and Tin Pan Alley Cats from a musical point of view, focusing on their use of jazz. What is Ebonics (African American English)? – an article describing the speech patterns many of the black characters use in the censored cartoons to the stereotypic extreme.